20 years ago I worked above a garage in Manchester. The owner was a young man who liked fast cars, but in Britain the roads are monitored with cameras and speed traps making it easy to lose your license through the points deduction system. My boy racer friend had a solution however, on the rear view mirror he had a radar detection system. These systems were illegal to use, but not to own, so although visible to a passing police officer there was little they could do about it. 20 years on the technology has improved. Now for 6 euros you can download Radardroid, it sits in your smartphone and informs you when you are getting close to a speed camera or radar. This App sends a visual and sonic signal to warn you, so you can slow down and avoid fines and potentially losing your license. There are many systems available. Some like Radardroid are openly helping you to avoid abiding by the law, but others market themselves as driver help tools. They let you know when there is a traffic jam ahead, bad weather or a radar by describing them all as ‘risk zones’. These systems have even been endorsed by some European governments and car manufacturing companies are starting to put the technology directly into their cars. One problem remains however, in some countries the use of this technology is prohibited. Germany and Switzerland enforce bans on such technology, something that was easy with older systems that could be spotted from outside the car. But what about if it sits within your phone. How can a sovereign state stop people driving on their territory with an App in their phone? Will they stop cars that are factory fitted with the technology from crossing their borders? I doubt that enforcement will be possible, and this highlights just one of the problems of the management of a single market across different sovereign countries. Technology transcends geographic boundaries, as the internet buying of banned products has proved. And this leads me to my final question, does this mean that people only abide by the law because they think that they might get into trouble if they don’t? What are the ethical implications of the marketing and endorsing of such products? If this process continues many laws will become obsolete as technology finds ways to avoid being caught. In Italy you have to pay to use the motorways, so you get a ticket when you enter, that you present when you leave and pay. On some motorways they have introduced what they call a tutor. It is old school technology, the ticket has the time you enter stamped on it. When you leave the time is registered again. If you cover more distance than is possible while remaining within the speed limit you get a fine. A simple A to B calculation that has dramatically cut deaths on my local motorway. If you are interested in reading more about ethics in technological innovation take a look at my work blog. In Britain we have toll roads, but having to pay every time you use the motorway is a bit much isn’t it? Do they still have road tax? I like the ticket idea, very clever, like our average speed cameras. That said, what is to stop you doing 100mph for most of the journey, pulling over at the services for a coffee and then finishing off at 100mph? When I drive in a 30mph zone, I drive at 30 as I don’t want to loose my license, and because I am not sure I could live with myself if I hit someone and couldn’t stop due to my speed. Morally I think if I was going below 30 and despite all my efforts hit someone, although I would feel terrible, I think I would cope, but I am not sure I could if I was going much above 30. Yes they still have a road tax. Many countries in Europe charge for motorway use. As for the ‘cheating’, the tutor idea is also backed up with cameras, so you may get caught speeding anyway even if you think you can calculate a way to include the stop. You touch on a point here that I try to hint on in the post, about why people obey (or not) the law. If you don’t drink and drive or speed because you know that if you do the police might get you, then you might look to technology to help you avoid them. If you don’t do it because it is dangerous then you won’t think about it. I have lived in both Italy where there are laws but fewer people respect them, and the UK where they respect the law (generalizations of course). We know however in Italy that the traffic police are very unlikely to catch you, and that there are ways of avoiding punishment if they do, not the case in the UK. So we don’t abide by the law in Italy because we know that we will probably not be punished, but we do in the Uk for the exact same but opposite reason. I wonder what UK roads would be like if they weren’t so well policed with cameras and patrol cars… would we all drive more dangerously? I think the advertising they do does help, a fact that I still remember is hit a child at 40 and there is an 80% chance they will die, hit them at 30 and there is an 80% chance they will live. When told they can’t have a device telling you where the cameras are, they argue back that it also tells you the speed limit, to try to slow drivers down. I Australia radar detectors have been illegal for quite some time. I’m not sure how it would work with an app though. I like the idea of the ticket system in Italy, I was in Rome earlier in the year and people seemed to have very little regard for speed limits and a number of other road rules. Maybe I’m being a silly female but why don’t they build cars without the ability to drive over 70MPH for example. One question comes to mind, do drivers not abide by the law because they arae ignorant or because in this busy rush, rush life stlye we have, time doesn’t permit it or we have too many pressures and deadlines in our heads that we are more focused on those than driving safely and sensibly? Interesting idea Fern, however what if you wanted your car for recreational purposes, on private land you can do whatever speed you like? Also it is being debated as to whether very soon UK motorways should be at an 80mph limit. Besides, if the limiting technology is in a car, someone will work out how to disable it. If drivers are ignorant of the limit, then surely they shouldn’t have passed their test? Great piece of thought Fern. Seems quite philosophical and but like Christopher said if limiting factor was ever associated in cars, the curiosity in human to breakthrough the limits would have created a crack for by-passing the limiting technology. Limiting the speed is not the solution to the problem, it is the moral ethic which can make it possible to limit ourselves from rushing and convince us to drive sensibly and safely. What everyone needs to do is modify their lives so they don’t feel rushed! Quite idealistic but I guess not practically feasible due to competitive market scenario. Each person is competing in more than one area, so rushing has become the habit of individuals. Oh it is practical and possible, it just requires a different perspective on life. I am writing from New Zealand where we have hidden speed cameras and as a high mileage driver I have had many tickets from these. I am not a fast driver and do not consciously flaunt the law, but seem to get caught with the flow of traffic at times so I guess we are all being ticketed, must be a great return for the traffic department! Fortunately the hidden camera offences are not driver specific so demerit points are not involved, just the monetary fine. Tomorrow I going to try out Radardroid, sounds great as it shouldn’t draw adverse attention as radar detectors do. Interesting that if you get caught speeding by a hidden camera, you only get a fine. Surely if you are speeding you should get points on your license? road deaths are at least coming down in NZ, although very slowly. I remember 20 years ago it was really out of control, so maybe the fine and camera ploy is working. Drink I think is the main problem though. A great question asked Jonny. Do people abide by the law just for the sake of avoiding trouble? I think that the human nature is paradoxical. The fact that rules exist, is enough for people to be interested in wanting to break them. It shouldn’t be like that, but it is. A world without rules to tell us what to do should eventually eliminate this problem. Sounds like an interesting idea. Societies always create their own rules though. If you look at social experiments such as Christiania in Copenhagen or others you find that when a society grows of its own accord, they create rules. The difference is the population create the rules first hand. Rules are a collective decision a community or society agrees upon. It’s in the best interest of people which is why everyone adheres to it. Then why does the need to enforce those rules arise? The fact that the collective agrees upon a rule does not mean that every individual does. We all feel that we have the right to bend an unjust rule right? 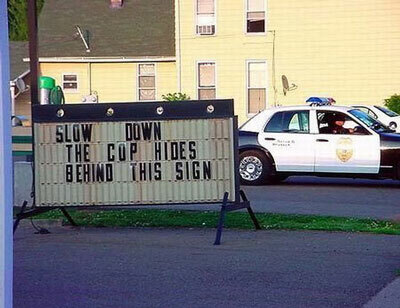 I hate when cops hide behind obstacles to nab drivers! Okay, we shouldn’t be speeding but it seems wrong when there are radars and hiding authorities. There should be apps like these in all countries because those same tactics are done practically everywhere, I imagine. I love that sign warning drivers about the hidden patrol. If you break the law, should you not expect to be caught/reprimanded? It’s a tough one, as sometimes it can be safe to drive at 40 in a 30, but it depends on the conditions and drivers judgement, hence they make it at 30 not a 40. If you want to make a law you have to enforce it otherwise people will not obey it. This libertarian idea that you have to do what you want is unjust, if you want to live in a state you have to either obey the laws or face consequences.